I got up at 7am and headed downstairs to the gym for a bit of cycling to start the day. We had an awesome buffet breakfast at the hotel and I went back up to my room to do some work, the real world keeps knocking and I have to take the opportunity to use the reliable wifi to catch up on a bunch of emails. I went out for a bit of a stroll around midday to check out the Temple of the Sun which was mostly closed for maintenance. Eugenia arrived in the early afternoon and we both spent the day researching and emailing. I made a bit of a break through with some ideas for a show coming up in January. A little time and space is all it needed. Justin was at the venue doing his tech check and Eugenia and I headed out to a little bar to meet up with Joanna Bayndrian, Sophie Cai and her partner Malcom. We checked out Joanna’s little apartment, it was basically two rooms on top of each other with a little bathroom under the stairs/ladder. It was tiny but really functional and neat with a lot of very handsome cats living in the courtyard. We hung out at the bar for a bit and walked up the street to a little Italian restaurant. It’s the full moon festival and the streets are packed with families, people were wandering around with 3D printed full moons, I really want to get my hands on one before I go. We doused ourselves with pasta and wine while Joanna filled us in about Beijing before Veronica and Justin joined us. Around 10pm we headed to Galaxy Soho for Justin’s gig. I haven’t really been to a club for quite a few years but I can deal with a bit of gut thumping bass and being super sweaty for a while to see Carrion in action. It turned out that he was headlining and wasn’t due on stage until 130am. I entertained myself chatting to Joanna’s friends and there were quite a few people from Shen’s studio forum who showed up to see Justin too. 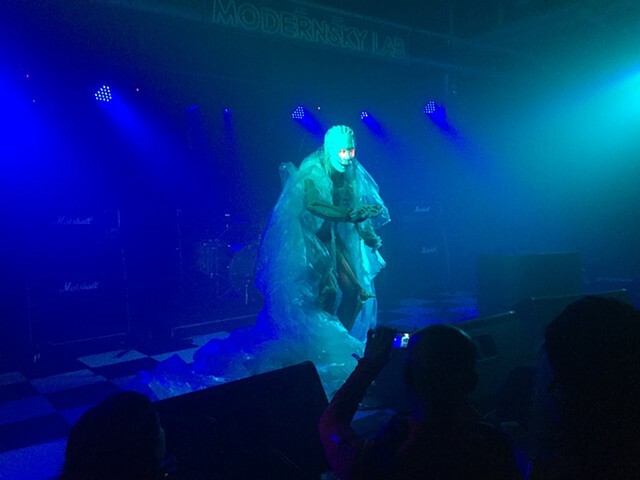 Modernsky Lab was full of young hip folk having a great time. Alvin and the Asian Dope Boys were totally in their element, I love seeing people living good lives and building glorious worlds around themselves! Justin finally hit the stage at 1.45am bringing the whole place to a standstill in rapt attention. I’ve never seen his live act and he delivered such an amazing spectacle, he really blew everyone’s minds in there. Carrion is truly otherworldly and Justin’s transformation is a complete experience. He absolutely killed it! Look him up, look at everything he does, tell everyone you know, put a budget together and bring this man to the world because it’s going to come to him. Veronica, Eugenia and I headed back to the hotel and crashed out by 230am, long after my designated pumpkin time.